The medium of television, although a daily part of most modern lives, remains mysterious in the manner it may influence its audience. At the center of this mysery lies the debate of content vs. medium without regard to its content. 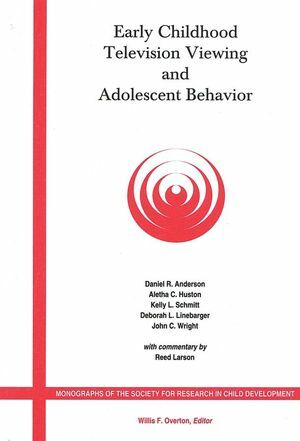 This monograph presents new research in this debate by following up on a report of 570 adolescents studied as preschoolers and the long-term relationships between preschool television viewing and adolescent achievement, behavior, and attitudes. The results of the report provide stron support for content-based hypotheses then for theories emphasizing television as a medium. In an interesting twist, the results of the report trace a cognitive difference in the patterns of boys and girls and the way television influences them. 3. Media Use in Adolescence. 9. Self-Image: Role Model Preference and Body Image. Commentary: Children and Adolescents in a Changing Media World.